I have two cards to share with you! In both I’m using a stamp set I love from My Craft Spot store: Clock Time. Dies – Spellbinders Rose Creations and A2 Matting Basics A, Our Daily Bread Designs Flourished Star Pattern, Cas-ual Fridays Casual Vine, MFT Notebook Paper, Cheery Lynn Designs English Tea Party Doily. I went for a shabby chic style with my first card, using lots of texture and embellishments. To make the stamped and heat embossed clock image stand out I mounted it on top of a resin frame I made from scratch, and that I colored with Iridiscent Paint in Berry. I made some pretty shabby flowers and colored them with Crafter´s inks, trying to get different tones of pink by blending Berry and Sunshine inks. Besides all the layers added I applied crackle embossing paste too. To finish the card I stamped a beautiful sentiment from the same set on a piece of cardstock I ripped and sponged with ink. My second card has a classy and elegant design. I wanted to make the clock stand out by adding it to the craft metal lamp post die cut. I created a window with the help of a beautiful frame die and stamped the sentiment on the center (or almost on the center) of the card. To finish the design I adhered some intricate gate/fence die cuts and a few leaves embellished with crystals. I love how well the metallic colors go together and how much they contribute to the final classic look of this card! I want to thank Kimberly for her invitation. I have had so much fun with this amazing stamp set, and I know I will continue to enjoy it! I invite you to come check My Craft Spot blog where you’ll find a daily dose of inspiration and creative ideas. Thank you for taking time to read and check out my cards. I hope you liked my designs and feel inspired to try out this beautiful stamp set too! Beautiful cards, Gracie! I love all of the pretty details you add! Thanks for being a guest designer at My Craft Spot! Gracie, your cards are so BEAUTIFUL! 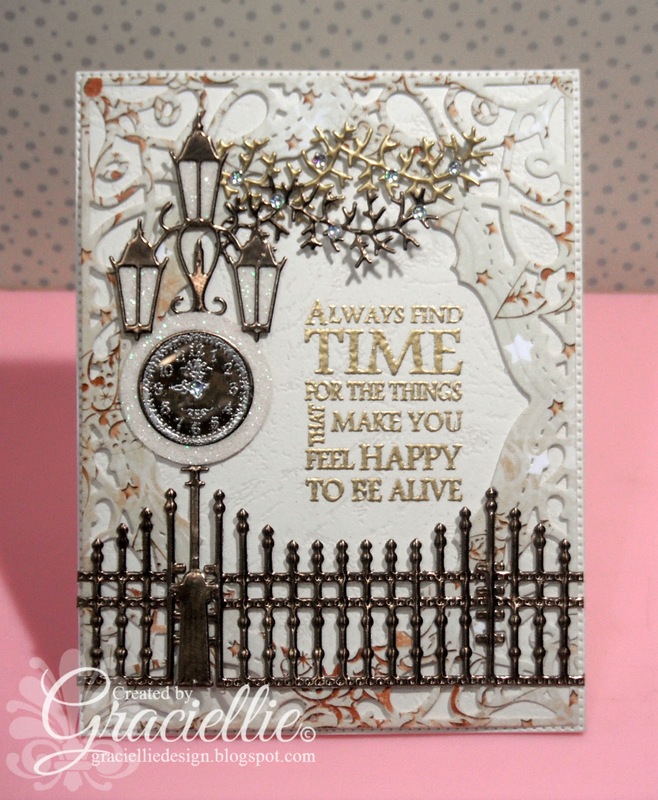 The intricate details are so pretty and the embossed sentiments look amazing! WOW!! Such gorgeous cards! Awesome job & Congrats on your GDS over at MCS! Love both cards but think I like the lamp post with the clock the best. You are such an artist. Love your work! Gracie…. beautiful as always and thank you for joining us over at HIMCR… Like how you incorporated the clock with the lamp very smart…and creative. Oh my goodness Gracie, both cards are gorgeous! I love the second one with the lamp post so many wonderful details. Thanks for joining us in the Poppystamps Challenge !